H. A. Gleason, like Henry Cowles, Frederic Clements, W. S. Cooper and others of his generation, considered himself a proponent of what was then called "dynamic ecology," emphasizing the matter of change. Gleason was first attracted by the work of Cowles, but soon found himself unable to support the idea of plant formations as superorganismal units in the manner Clements came to accept. In fact, he concluded that species tended to distribute themselves independently of one another, an idea that became known as the "individualistic hypothesis." Gleason first expressed his displeasure with the Clements model in a 1917 paper, and then ratcheted up the argument in a classic work published in 1926. Gleason was able to attract but little interest to his approach until the late 1940s and 1950s, when F. E. Egler, H. L. Mason, S. A. Cain, J. T. Curtis, and R. H. Whittaker began to support him; in the years since it has remained an important subject of discussion. 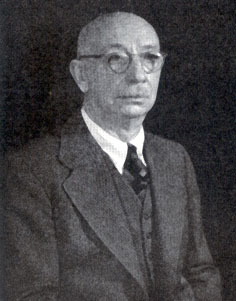 Gleason was also involved in other important work including, briefly: quadrat sampling methodology (including his derivation of the Gleason Index); his early recognition of the Midwest's prairie peninsula (of grassland stretches extending into otherwise forested areas); regional vegetation history studies (especially of the Midwest and Northeast); and a large quantity of botanical taxonomy (over two hundred publications). His last two books, Manual of Vascular Plants of the Northeastern United States and Adjacent Canada and The Natural Geography of Plants, were completed after his eightieth birthday. --born in Dalton City, Illinois, on 2 January 1882. --dies on 12 April 1975. --Botanical Review, Vol. 56(2) (1990): 91-161. --Bulletin of the Torrey Botanical Club, Vol. 102(5) (1975): 253-273. --Bulletin of the Torrey Botanical Club, Vol. 102(5) (1975): 274-277. --Bulletin of the Ecological Society of America, Vol. 83(2) (2002): 133-142.